Gamecaster is a graphical user interface for open source project glc. It can capture real time footage of any Linux game that uses ALSA for sound and OpenGL for drawing. Gamecaster is written in GTK3 and Python and it is first application I have developed for Linux. I have never learnt programming so the code is probably not very good. That said, the application has been tested properly and it should work as described. For installing in other distributions, you will have to get the latest tarball release from Launchpad. Required dependencies are: ffmpeg, xdotool, glc, vorbis-tools, mkvtoolnix, python-gmenu, python. Installation may require following dependencies: python-setuptools, python-distutils-extra. Default installation path is /usr/local. As this is first release, Gamecaster is very much in alpha stage. So in case of any issue, please report a bug at https://bugs.launchpad.net/gamecaster/+filebug. If you have disabled global menu in Unity, the application toolbar may look badly themed. Reloading your current GTK theme or switching to any other will fix it. Under KDE, some text may not be properly aligned. 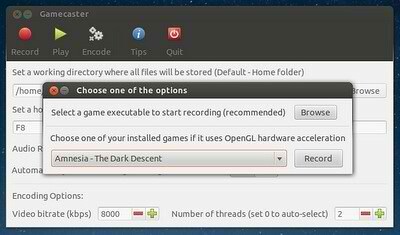 1 comment to ''New Real Time Video Capture Tool for Linux Games"